Scotland can offer the perfect solution to your Christmas present worries as it becomes a gin lovers perfect winter wonderland. As the ski centres celebrate an early start to the season and Radio Two’s sweepstake on the first announcement of the snow gates closing the A939 Cockbridge to Tomintoul ending sooner than expected, it can feel as though the long dark nights of winter are endlessly stretching ahead. But this time of year brings benefits to the wider world too, especially those of us who appreciate the finer things in life (well who doesn’t?). So, consider booking a romantic weekend or unexpected off-season holiday for your gin-loving one and only, which is sure to be well received on Christmas morning! The summer roads can be crowded and car parks full, but in winter Scotland takes on a whole new personality. While snow gates and the like mean a flexible itinerary is mandatory, having these majestic spaces to yourself is worth wearing an extra jacket for. It’s also a great excuse to ditch the tent or the caravan and head for the luxury of a hotel, inn or B&B, as they offer some outstanding deals at this time of the year. For true luxury try The Torridon which now has it’s very own gin called Arcturus. The name refers to the brightest star in the Northern Hemisphere, and at The Torridon, with no light pollution for miles, you may well spot it outdoors as well as in the luxury of the hotel bar. The Winter Gourmet break is available from November through to March and includes a four course dinner in their triple AA Rosette restaurant, at £285 per night for 2 people sharing. Just south and over the sea to Skye discover Kinloch Lodge Hotel with views across the Sound of Sleat to the mountains of Knoydart beyond. The ancient seat of the Clan MacDonald, here the Clan Chiefs discussed whether to join the clans at Culloden. It’s full of history, wonderful antiques, family heirlooms and roaring log fires not to mention a great selection of Scottish gins, some of which you are unlikely to have seen before. A winter break including a five course dinner in the Michelin starred restaurant is priced at £140 per person per night. This rate is available until the end of March, and allows visitors to explore Skye without the queues, but with all of those stunning mountain and seascapes still very much on show. For more modest budgets there are plenty of other options too. The Auld Post Office near Thurso is a luxury award winning bed and breakfast with a wonderful specialist activity for their guests – a Gin Tasting evening in house, with knowledgeable and engaging hosts Lynne and Weyland. Dinner is available just up the road or in Thurso town. There’s a lot to explore around here, and it doesn’t take long to get here from Inverness. Rooms with full breakfast range from £85 – £95 per night (included 2 guests), so it’s an affordable break but with loads to recommend it. On the outskirts of Pitlochry East Haugh House is a traditional Inn accommodating River Tay fishermen and women over many years. Their reputation for great food and hospitality is established and reinforced every year and this family run business really does go the extra mile for their guests. Winter breaks are priced at £159 B&B for TWO nights with two people sharing, so add a budget of £25 – £30 per person for dinner and you can enjoy a great location to explore Highland Perthshire and some warm and cosy surroundings for your precious time away from home. If more rugged scenery is your thing, then Clachaig Inn in Glencoe could suit you best. Another Inn with it’s own Gin (The Clachaig) on offer, it holds regular live music events and beer festivals and caters for outdoorsy types as well as those who prefer to spot their Munros through binoculars! Rooms start at £50 per night per person for bed and breakfast, and this makes a great base from which to explore Fort William and the Nevis Range Ski Area as well as Glencoe itself. 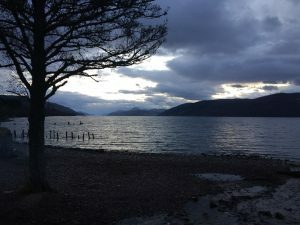 The Road to the Isles and the Glenfinnan Monument are within easy reach, and Oban’s bustling harbour has plenty to fill a day and is just an hour away down the picturesque shore road beside Loch Linnhe. Back to luxury and Meldrum House Hotel in Oldmeldrum, Aberdeenshire. This mansion house hotel has a vast array of Scottish Gins including local ones from Porters Gin, House of Elrick Gin and Lonewolf Gin, and their knowledgeable bar tenders handle all the best perfect serves with aplomb. Their Winter Warmer break offers dinner bed and breakfast in a deluxe Stables Room for £285 per night for two people sharing. And look out for their January Sale when many rooms will be half price! For more ideas visit Ginspired Scotland to search by region. Remember to select your region on the Gincyclopedia then zoom in to see accommodation and food and drink suggestions, and retail too. So go on, get Ginspired and make a gin lovers day this Christmas! If you have suggestions for us please send them in – we’d love to feature them in our blogGIN and on the website – full credit to you! Use the hashtag #ginspired and #lovescottishgin Thanks! Winter Wonderland as Loch Ness shares it’s unique atmosphere under a wintry sky.